Along with the soaring of the fuel energy, commutation has become not only a new way to save money but also a fashion. It's indeed a boring life experience if you have nothing to do in this congested and limited space. The Series MPC300BT is available as Box with a terminal block to easily screw the push button cables on it and RS232 Interface to connect to any RS232 Touch Screen. Network Player automatically download the content according to a predefined playlist through newwork from the manaement sofrware. Winmate's Network Player family is growing very fast and now joined the powerful MSS970 series into Winmate's Digital Signage products. The MSS970 is a Full HD Player, bundled with MSO Pro as Management Software. An LCD housed in a sleek metal housing, giving it a custom designed look. It is excellent for any space-constricted applications within a variety of different environments. Network Player Music has the ability to firmly manage clients and groups; adopts DHCP mode of transfer technology, it greatly eliminates the need for clients to have fixed IP. The 6-in-1 media player (digital frame/ picture frame) brings entertainment within easy reach. This player features a compact, dual slot design compatible with Compact Flash and IBM Micro drive working concurrently with the Smart Media, Memory Stick, and Multimedia Card/Secure Digital. Winmate is one of the leading companies dedicated in Embedded Digital Signage since nearly 10 years. During this years the knowhow and experience did grow our success in this business unit, that today Winmate has 2 key product groups, with 13 Families with over 500 different products, the widest Digital Signage product range world wide. Key focus is to provide a Digital Signage Platform as a Bundle with the Player Hardware combined with the Player Software and the Management Software for the centralized management of the Digital Signage Network. So the Customer gets a running system out of the box and just need to care about his content, and not about drivers and cables. There are two categories of Digital Signage solution: Standalone & Networked. In Standalone solution, you only need to put media files in memory card (CF/microDrive/SD/MS/SM/MMC), then plug it into Media Player and start to play. In Networked solution, we will provide management software (MSO series) for you to edit playlist, schedule, and media files, then transfer to Network Player through Ethernet. Network Player features powerful embedded playing engine to guarantee the stable playback of multimedia. Equipped to handle high quality of video, graphics, and scrolling messages; it is ideal for delivering the content according to a predefined playlist through network. Winmate continuously develops new functions for Network Player, according to customer’s feedback and application needs. Useful functions are: RSS Feed, 3G Integration, Client Billing Log, Motion Detect…etc. With the network player solution, you will have the ability to firmly manage clients through Ethernet or Internet. Clients automatically download the content according to a predefined playlist through network input. It features a excellent solution for easy installation and easy-to-use network operation. We have a full range of Network Player series for you to choose from; depends on the needs of your applications, you can choose the suitable solution. To fulfill diversified demands from various segments, there are millions of mounting types needed. Chassis, Open Frame, Panel Mount, you name it! Based on the experience in Industrial Display, our various Digital Signage product lines with different designs Integrated Network Player from 7” to 42”. We can provide the suitable solution to meet your requirements. The Media Player brings entertainment within easy reach. This player features a compact, dual slot design compatible with Compact Flash and IBM Micro drive working concurrently with the Smart Media, Memory Stick, and Multimedia Card/Secure Digital. As a stand-alone player, this offers an alternative to the cumbersome process of connecting digital data devices directly to a PC or Mac. This player is versatile, and works with most removable digital media. We have a full range of Media Player series for you to choose from; depends on the needs of your applications, you can choose the suitable solution. To fulfill diversified demands from various segments, there are millions of mounting types needed. Chassis, Open Frame, you name it! Based on the experience in Industrial Display, our various Digital Signage product lines with different designs Integrated Media Player from 7” to 42”. We can provide the suitable solution to meet your requirements. MPO is the user-friendly software which allows you to create touch and button projects in simple steps. Supported media formats are MPEG 1/2/4, MP3, and jpg. You can easily create your own interactive signage program and enjoy the stunning multimedia playback. A dynamic sign has more than 10 times power to getyour customers' attention. Once you have their attention, you have an opportunity to influence theirbuying decisions. The biggest challenge for retailers when dealing with traditional print marketing is to make sure that signs are put up at the right time and in the right place. With digital signage, retailers are able to change the content, at anytime, anywhere. Eliminating the need to print and distribute static signs every time you change your marketing strategies. Save on printing/distributing costs and processing time. When to Start Digital Signage? The answer is NOW! As iSuppli Corp. estimates, the digital signage market revenue will grow a total of 20% Compound Annual Growth Rate from 2004 to 2009.It has emerged as a significant trend among retailers to be the most cost-effective solution to communicate with their customers. Retailers are using digital signage not only to enhance sales and improve shopping experience, but also to generate advertising revenue from suppliers. Figure below presents iSupplis digital-signage forecast. Digital media content is sent to a central control PC. Through user-friendly signage management software, you can create play list that arrange the way you want to present the media content. Exposes content and play list out to the play units through the network. Play units deliver the content according to the predefined play list. Depending on your application and level of management control, we have created different MSO software for you to choose from. All Network Players are packed as HW+SW bundles, please see the following table for detail. * If you need to manage more than 2000 players,please contact our sales representative for customized software package. Flash Network Player Solution for middle scale Digital Signage Network. Winmate's Network Player family is growing very fast and now joined the powerful MSS970 series into Winmate's Digital Signage products. The MSS970 is a Full HD Player, bundled with MSO Pro as Management Software. The MSS970 player is capable of playing nearly all Video, Image, HTML Flash, Power point slideshows and many other Multimedia Formats. Up to 9 suggested different zones can be designed in the layout designer, so MSS970 become a very attractive player in the Winmate's Network Player series. Winmate combines its 15 years of professional experience in designing and manufacturing and created this elegant and rugged Player which meets all requirements for your playback of advertising. New innovation in MSS650 Flash Network Player MSS970 series is the Zone Synchronization, which let your content movie be synchronized with other zones as pictures, messages, aso. Moreover, Winmate integrates Flash and HTML functions into MSS970 Flash Network Player that can play online source and fancy flash files. Winmate launches 3 models to choose, depending on the requirements of the project. 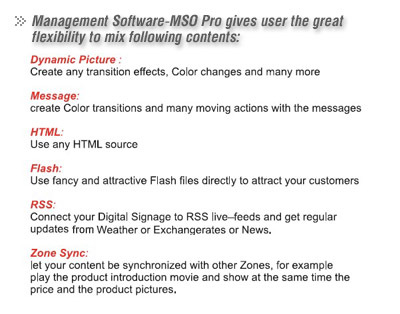 MSS970-I1 is more focused on Standard Definition Video Playback, combined with Flash, Message and HTML. Moreover, both MSS970-A1 and MSS970-I2 are capable of playing Full HD video, with a combination of Flash and other Multimedia Formats. See below table for a rough overview.